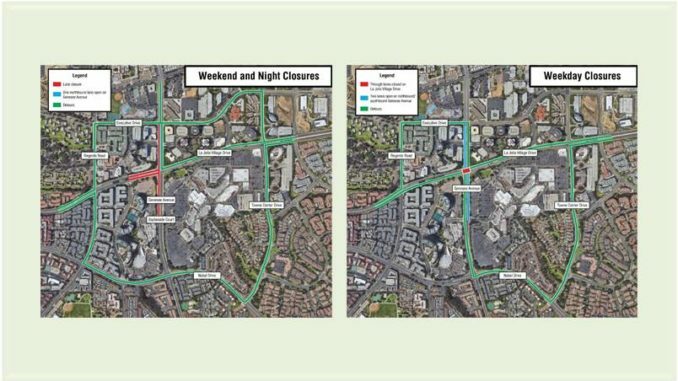 SANDAG announces weekend closure from 9 p.m. on Friday, February 8, to 5 a.m. on Monday, February 11 of southbound Genesee Avenue lanes and through lanes at the La Jolla Village Drive intersection. One lane open on northbound Genesee Avenue. Intermittent partial closures are currently in place along Genesee Avenue in support of Trolley bridge construction. Crews are installing pre-cast girders, which are large beams used to support the Trolley bridge. The girders will be placed on top of the columns to build the viaduct, which is the bridge structure that will carry the Trolley along its route. Crews have placed girders in five intersections along Genesee Avenue; this will be the sixth installation of girders in a series of seven intersections.